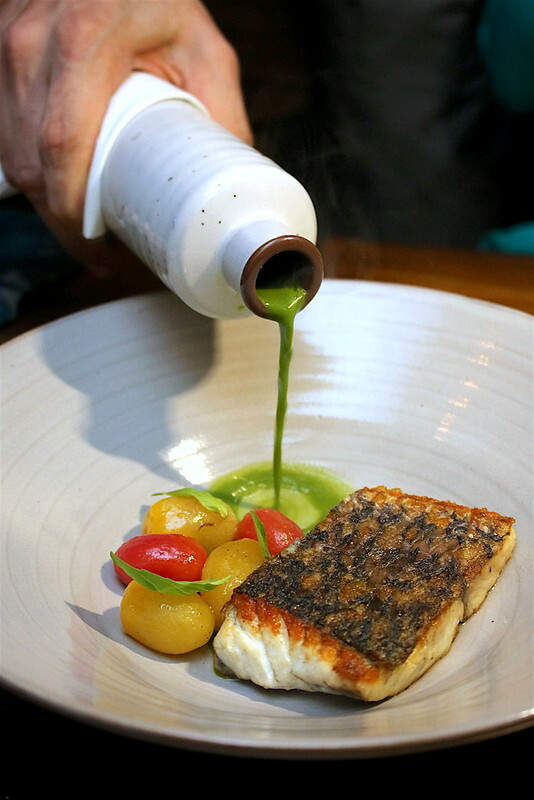 Maggie Joan is a tribute to Daniel's two grandmothers (Maggie and Joan) and the way they personify the Mediterranean ethos of good food, big-heartedness, and fine living with family and friends around you. 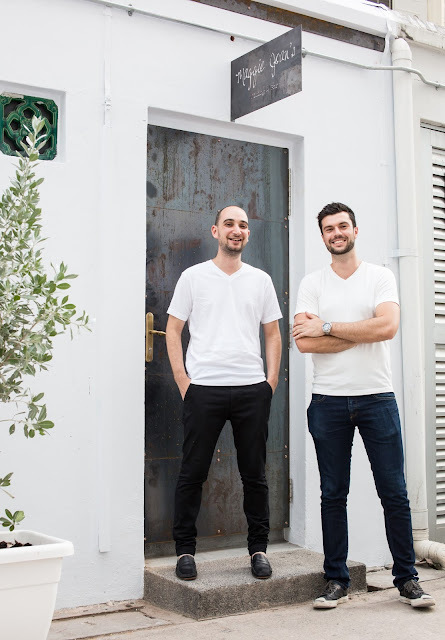 The focus is on making as many ingredients as possible from scratch “exactly like Grandma would”, using the freshest seasonal produce, and putting heart and soul into creative modern interpretations of Mediterranean cuisine. 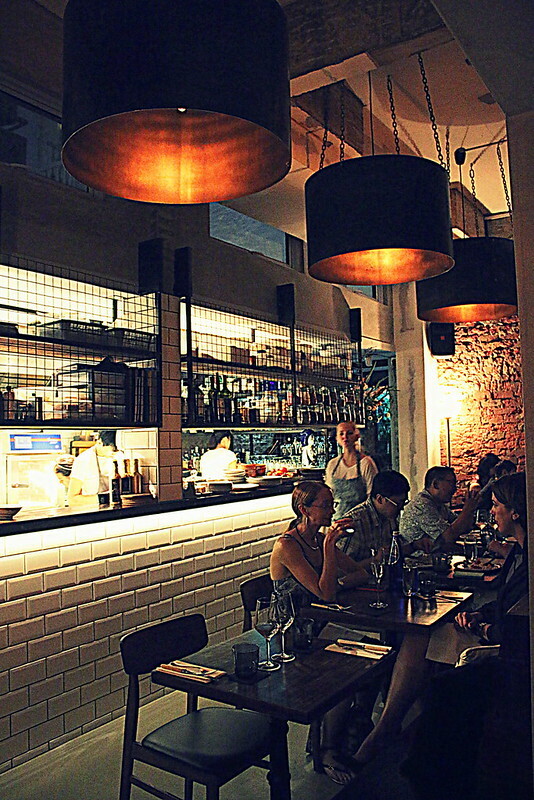 Head Chef Oliver Hyde, formerly of Pollen, helms the Maggie Joan’s kitchen and lends it some British influences. I hear he was also from the Waterside Inn and Restaurant Gordon Ramsay? They've got a fancy Inka charcoal oven in the compact open kitchen. Charcoal oven...mmmh, that's love. Almost as good as grandma's affections. OK, so the bread here is not free, but it's worth the S$5. 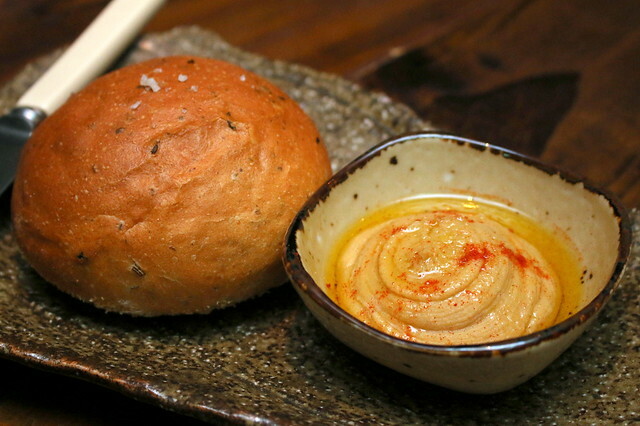 I'm trying to avoid carbs but I could not stop picking at the large soft roll with crisp skin. 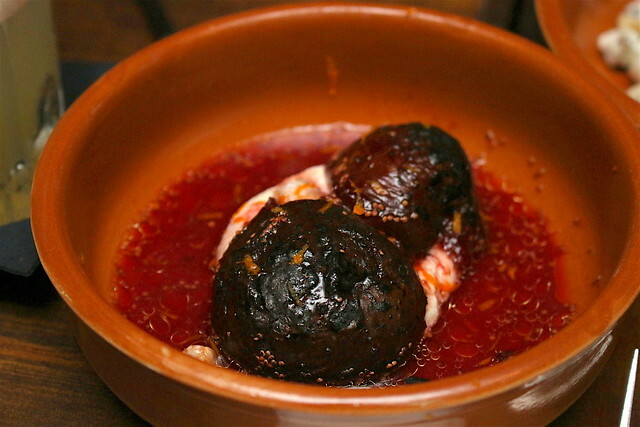 You can dip it in the cumin-spiked hummus or mop up the incredible sauces from the other dishes. 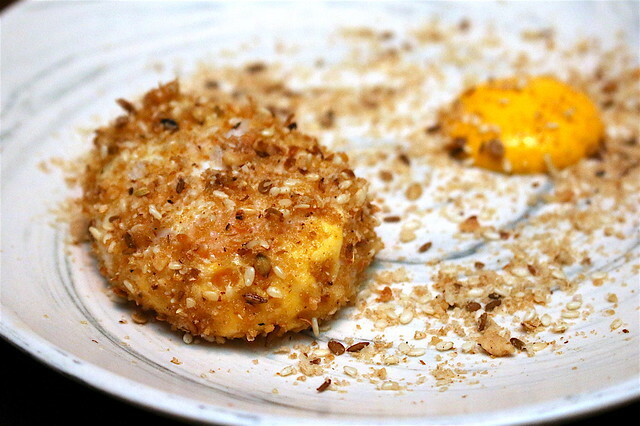 A slow poached egg is deftly deep-fried and rolled in dukkah (sesame, coriander, cumin, hazelnut and panko). Saffron aioli is served on the side, looking curiously like an egg yolk. Break the egg and just look at that rich yolk flow. 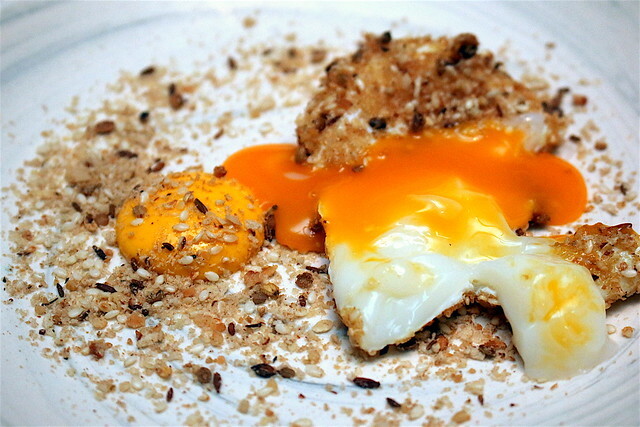 It's an interesting exercise in contrasting textures - the dusty dukkah with molten egg. I love these crisp Jerusalem artichokes from France. 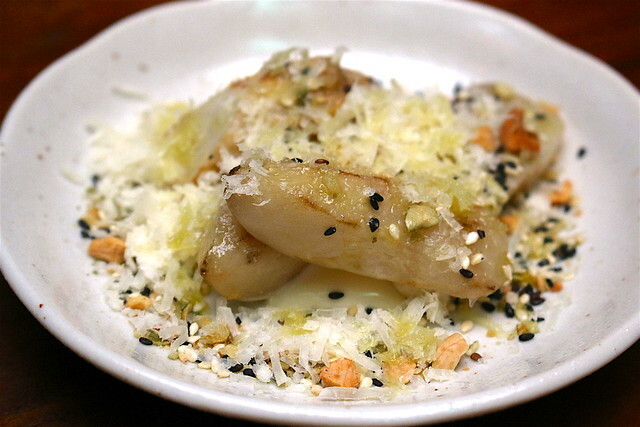 It's a mild tasting yet addictive dish with manchego cream, finely shaved manchego cheese and a mix of crushed almonds, sesame, pumpkin seed, and rosemary oil. 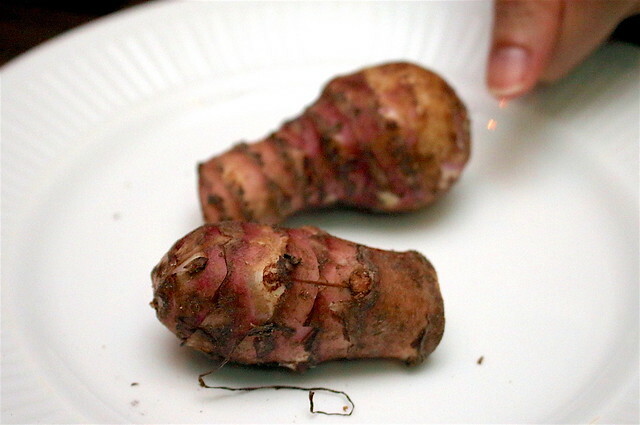 This is what the Jerusalem artichoke (also known as sunchoke) looks like. The kitchen here boils these little roots and removes the skin, then roasts them in a pan slowly to caramelise the exterior. Elsewhere, I've only ever had Jerusalem artichoke in the 55' Smoked Organic Egg at JAAN (back when Julien was new there) and in the gorgeous Capesante at Otto Ristorante in Sydney. 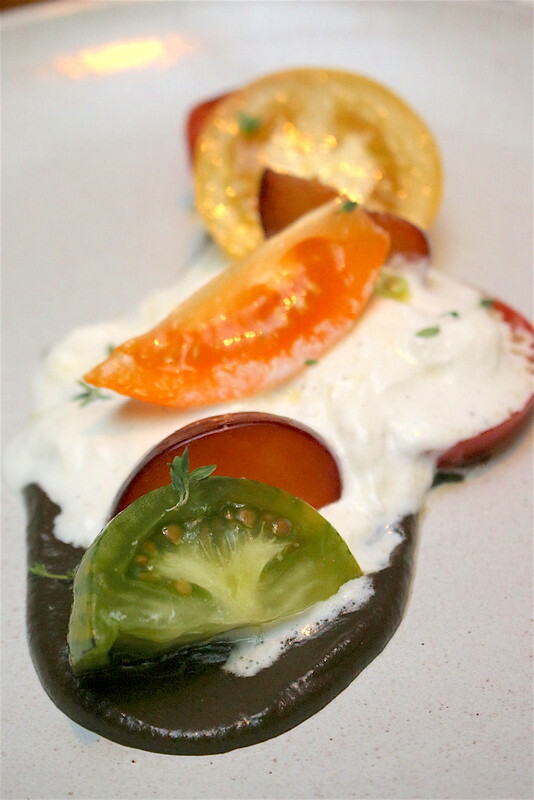 Heirloom tomatoes salad with tapenade, basil oil, and burrata from Italy, all perked up by the addition of compressed plum (pickled in vinegar, sugar, star anise, coriander seeds). This was pleasant, but not astounding. Scallop carpaccio (marinated in sherry dressing, lemon juice, olive oil, sherry) accompanied by a rather strong minty pea puree. Yes, there's rather a lot of peas here - puree, sprouts and baby peas - and the grassy element seems to overwhelm the mild dressing and even the Iberico paleta crispy ham. 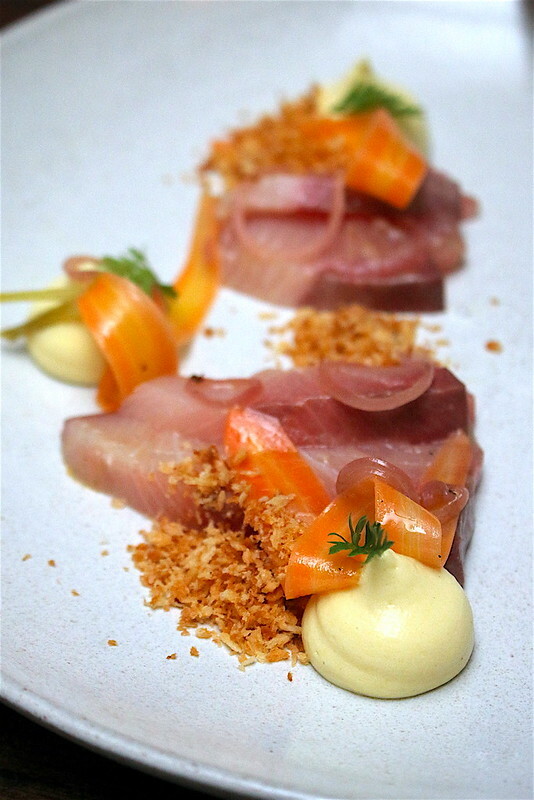 The yellow tail slabs are brushed with orange and lemon glaze, and arranged draped with vegetables escabeche (pickled vegetables) and finely sliced shallots. 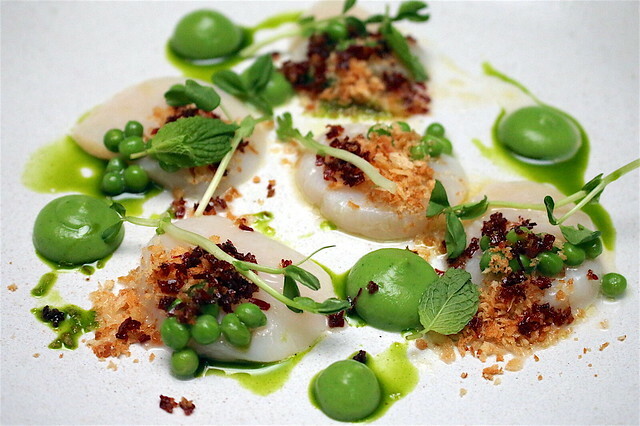 The fish is also topped with fried sourdough crumbs (which also appear in the scallops dish). What makes this shine is the brandade mousse made with fresh fish instead of the traditional dried cod. It's smooth and creamy with the mixture of milk, garlic, saffron, fish, potato and whipped cream. Next up is the kickass seabass. It gets a pesto bath. 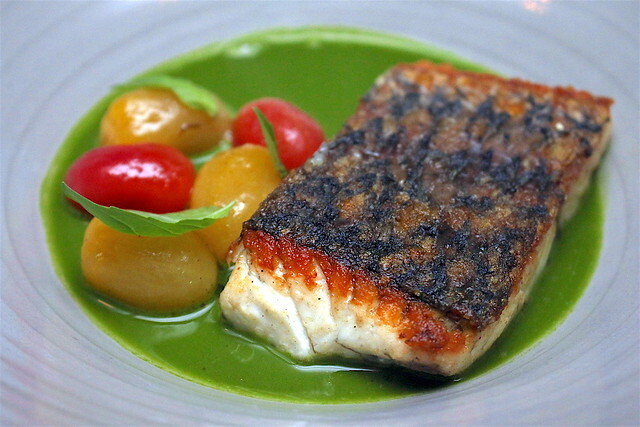 The panfried fish is complemented by two kinds of tomatoes - yellow tomatoes (soaked in honey and vanilla) and red cherry tomatoes (marinated in balsamic and garlic, thyme, olive oil). The light pesto broth has delicious accents of pinenuts, parmesan and garlic. But my favourite main has to be the grilled Iberico secreto. The Spanish pork is lovingly brined for 4 hours, then slow-cooked in a water bath for 8 hours, before being finished in the Inka oven. The result is fork-tender meat with that seductive smoky char. 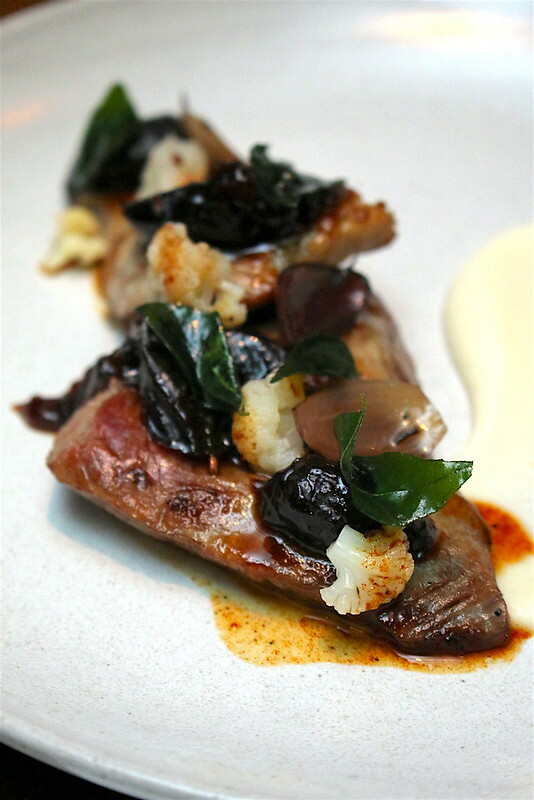 Decorating the tender pieces of pork are cauliflower puree, sherry-soaked prunes, charred shallots, pickled cauliflower, curry caramel made with rasel hanout, and fried curry leaves. Heaven. 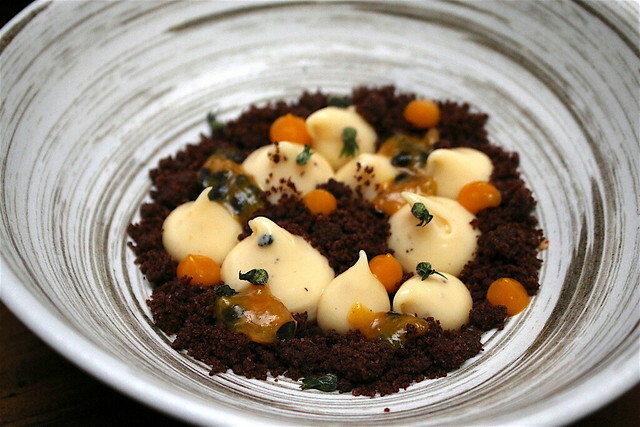 With tellicherry pepper from India, smoked passionfruit, mango gel, chocolate cookie crumble. This was okay; I am not much of a dessert or chocolate fan. Compressed fig with red wine, honey, thyme and brown sugar Fig jam, ricotta, almonds, hazelnut, with orange and balsamic dressing. I normally love figs but this was not my thing. However I can see red wine aficionados crooning over this as the wine element is pretty strong. Anyway, I've saved you the best dessert for last. 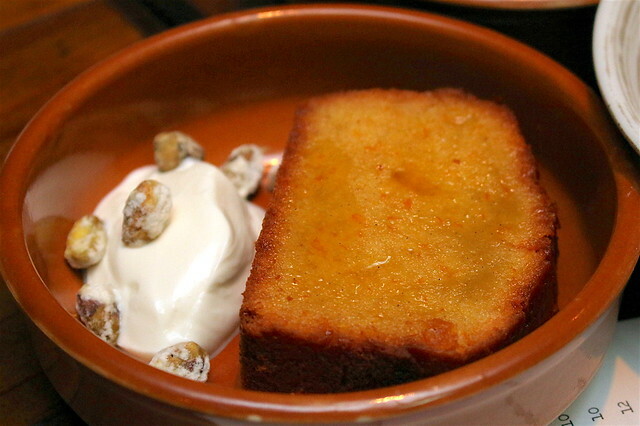 The orange cake is an olive oil based cake perfumed with almonds flowers and orange zest, brushed generously with orange syrup. Something about this feels really old school. The cake is dense and heavy but you keep coming back for more. The Greek yogurt infused with cardamon helps to cut through the cake a little. In general, it's well-thought out food here prepared with heart and skill, food that I'm sure Maggie and Joan would be proud of. The only difference is - as Mediterranean grandmas, they would probably pile on a bigger portion to make sure you eat enough.